Face to face, a couple kneels in a kiss; their sinuous bodies suggest one shared heart. 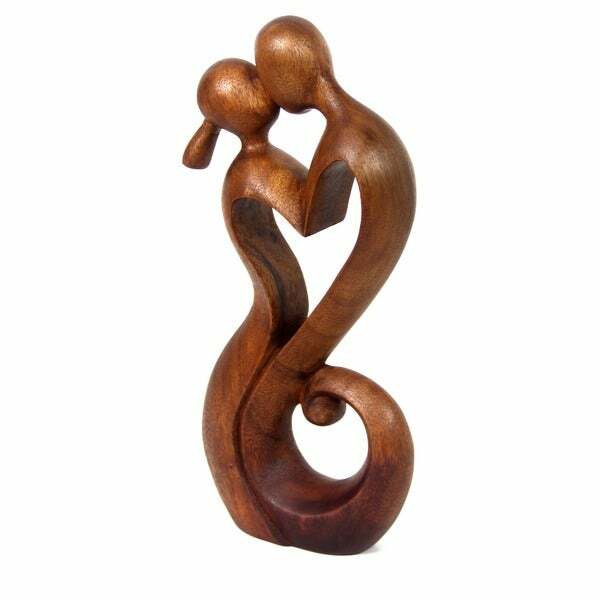 Made Wirata captures the force of the lovers' passion in a suar wood image. Wirata first learned to carve from his father, who specialized in a particular style of carving locally known as sri bunga as well as keris . When he finished elementary school, he apprenticed with his uncle, who taught him to carve traditional images. In 1993, his interest in art lead him to learn from a cousin how the carving of modern statuettes. Wirata began to sell his work in order to sustain his studies and now several galleries in Bali are collecting his creations. Perfect 5 year anniversary gift. My wife loves it. I purchased the Wood Everlasting Kiss Statuette as a gift for my daughter-in-law for Christmas. When I received it in the mail, it was prettier than I expected. It's not too small or too big. The workmanship is beautiful. It looks like an expensive piece of art. I am very satified with my purchase from Overstock. After seeing this in my neighbor's house, I decided to buy one for a friend as a 5th anniversary gift since the element that represents a 5th wedding anniversary is wood. She loved it and said it was the prettiest anniversary gift she received. It's larger than you think! When I decided to buy this statuette, I did so reluctantly. I'm not really into dust collector's but there was something about the statuette that drew me to it. It was also a bit more than I wanted to pay but since it's part of the NOVICA program I figured that even if I didn't like it - at least I was helping someone worthy! I have to say that I'm very impressed with it. The wood itself is a light wood - it doesn't weight a whole lot. I really like that about it - also the wood has been sanded very well and it's smooth to the touch. I do have to mention that because it is so light that it's very easy to knock over but lucky for me it's also very sturdy! One last thing is the picture does't really do it justice - I wasn't expecting the statuette to be as elegant as it is. I have owned this for about a year now. I love it. It goes perfectly in our bedroom. I do not like to spend much money on decorative items, but I had to make an exception for this one. Well worth it! I purchased this as a piece for my home. The wood is beautiful and like nothing I've seen before. It came very beautifully Packaged, from National Geographics. It also had to be signed for from Fed Ex. It took a little longer than expected but 3 days sooner than the promised delivery date. It is so pretty, I just can't tell you how much I love it. It was a little smaller than expected. This is something I'm going to have to be careful about when buying items on the internet. However, this is a gift or something that you'd buy for your home, that looks very rich. I love how the two people kissing looks like a heart. This will sit above my mantle. The only reason for the four stars instead of five, was the size. Otherwise it's gorgeous! It would make a lovely wedding gift for someone who has everything, while it looks very expensive, and wouldn't break the bank. Buy it, you will not be sorry! Very nice piece. Like the size and the weight of it. Nicely made. I did think it was a little expensive but it is very unique. Love this! Beautifully crafted piece of art. I saw this beautiful statuette and bought it as a Christmas present to myself. I was impressed that it was endorsed by The National Geographic in partnership to ensure that part of the proceeds go directly back to the village where this artisan lives. When I received the statuette I was even more pleased. It is very light weight so it's easy to handle. It is just the right height to be placed on the bedroom bureau and I look at it everyday. It reinforces what I want romantically with my boyfriend. It's wonderful to have such a gorgeous statuette from Bali. Very artistic and symbolic. For its size, these are great. Also, durable and made of real wood. I wish these are available in larger size for larger area. i bought this for my anniversary, i love it. so different and beautifully sculpted. the workmanship is amazing. it is well made and we liked it a lot. Beautiful sculpture. I gave it as a gift and my niece loves it. Beautiful! I love it!!! I highly recommend it! Gave as a wedding gift. It sits in a prominent place on the newly weds mantle. they loved it. Because is symbol of Love. And if You have in Your bedroom , this statuette , attracts the real love. Also is beutiful, very good finished ,and the wood is strong and perfectly carverd.